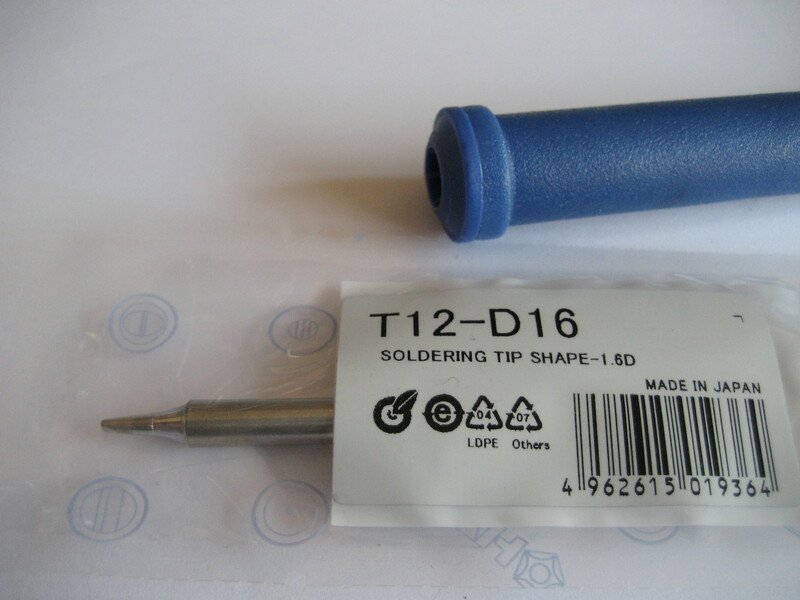 In series thermocouple soldering iron have a thermocouple in series with their heating element and thus only have two connections (actually one more which is electrically connected to the tip for ESD purposes). When a voltage is applied to the two terminals the tip heats, when unpowered the thermocouple voltage can be read. This controller uses a skipped variable puls modulation to keep the temperature of the tip steady. During the off period the thermocouple voltage is sampled and the temperature is calculated from that. The temperature is then compared to the setpoint and pulses are skipped when the temperature of the tip is higher to allow it to cool down. If the temperature of the tip is less a pulse is applied. When the temperature is near (approx. 5-10 degrees C) its setpoint shorter pulses are used to minimized the overshoot. A powersupply capable of supplying 12-24VDC, 3A is needed to power the soldering iron controller. For maximum performance 24V, 3A is required. Connect the positive side of the powersupply to the +24V and the negative side to the -24V terminal. To use the ESD features connect EARTH to protective earth. The tip is grounded through this connection with a 1MΩ resistor. The + and – connections from the soldering tip are connected to the T12+ and T12- terminals. If you got the handle officially red is positive, black negative and green tip. 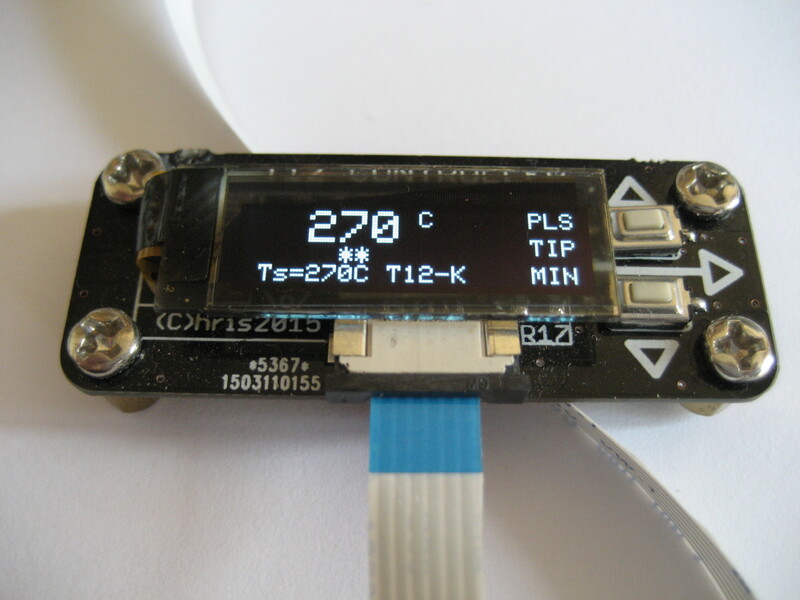 If the tip is connected backwards, the temperature display always states the tip is at 25 degrees C but it gets really hot. Please disconnect the power immediately and rewire the handle!! When a solderinghandle is connected !TP and GND should be shorted too (all the magic should be handled in the solderinghandle connector). Optional there is a powerdown pin (!PD) which can be used to detect when the handle is placed in a holder. The temperature is set to 150 degrees when this pin is grounded. 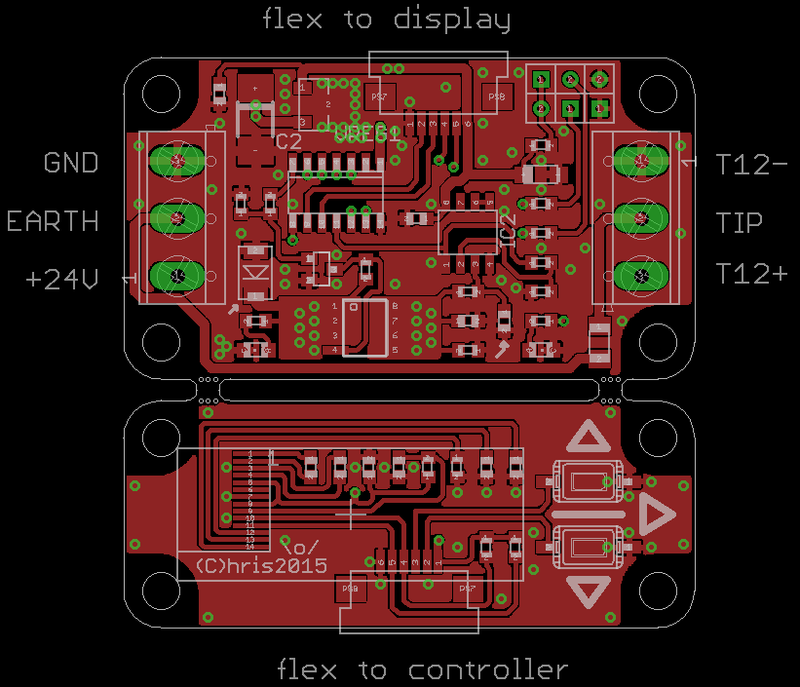 An optional 3V3 pin is available for powering your fancy handle detector. During normal operation the current tip temperature, the temperature setpoint and current tip is displayed. The two buttons can be used to alter the set temperature. When both buttons are pressed the tip can be selected along with it’s calibration data. Upto 31 tips can be selected, all stored in nonvolatile memory. NB. : When the system is in powerdown mode or no tip is connected the display is dimmed slightly and —ZZzZ– displayed. To enter this mode press the top button during poweron. Alter the ambient temperature with the buttons and press both when done. Factory default is 25 degrees C and should be ok for most purposes. Most of the time the tips dont need calibrations and the factory default values should work fine. Press the DOWN button during poweron to enter calibration mode. Please use leaded 60/40 solder for this procedure!! The reason is that this alloy has a perfect transition from solid to liquid at a well known temperature (183 degrees C). Unleaded solder differs a lot (217-230 degrees C) and is a bit hard to see the exact moment. First let the tip cooldown to roomtemperate (i.e. by sticking it into roomtemperaturewater) press next and wait untill the tip is heated, then use the up/down buttons to adjust the tip temperature untill it just starts to melt the solder. Press both button when done. Download the latest software below, make sure you got the right version for your display. 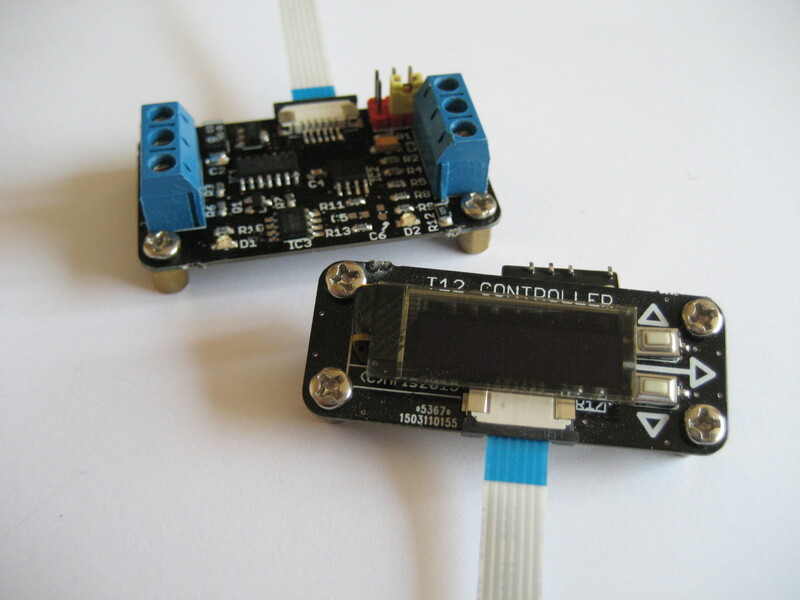 Firmware for 70W soldering iron controller with SSD1306 OLED. 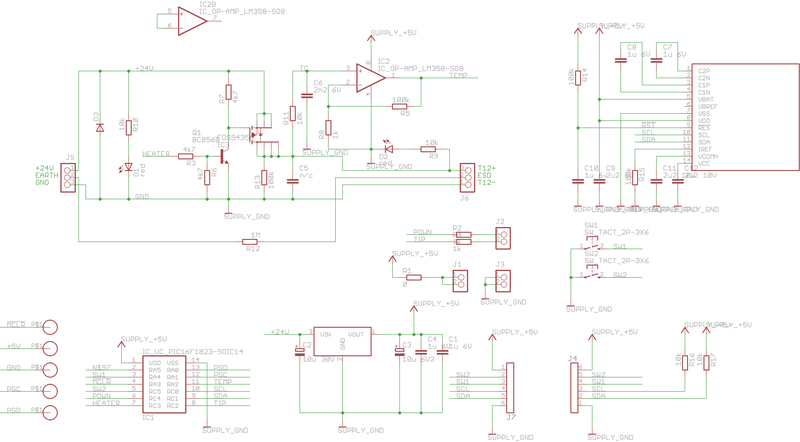 Firmware for 70W soldering iron controller with SH1106 OLED.